At the very least it'll get a soft reboot. I hope it gets a hard one. Anyway it looks like Green Lantern will get relaunched in September. For me this is bittersweet because while his new 52 was a snorefest, his rebirth work gets better with each issue. Issue 50 I wonder if Par(Hal)lax shows back up for an epic war. 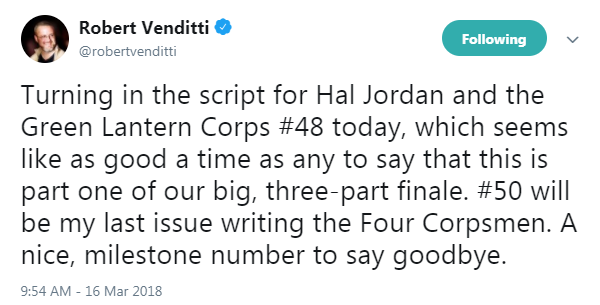 So has it been announced yet that #50 will be the final issue of HJ&TGLC yet? I honestly struggle with calling this title volume 6. But I know when the inevitable GL #1 comes out after, we will all retroactively refer to them as volumes 6 and the next one 7. In the solicits, I just wish they would make the announcement of what comes next. No mention of Par(Hal)lax in the solicits though. INo mention of Par(Hal)lax in the solicits though. I suspect that Hal is getting moved into the Green Lanterns comic, and that Morrison will write a comic that stars Guy and Kyle. Maybe he'll write Green Lanterns with Hal, but I think he'd rather write Kyle. Another possibility is that the two titles will go monthly, and he'll write both. Let's see whether I'm right. I would be fine with Guy and Kyle in a comic, as long as the writer doesn't make it the love-fest between those two characters that other writers have depicted. The fact that they're mismatched is a good thing and shouldn't be glossed over. I think Hal is going into Green Lanterns in an effort to uphold the diversity banner. Last edited by Trey Strain; 05-22-2018 at 07:56 PM. Oh and Dave -- was this anything I suggested at CBR? -- John in Justice League. -- Guy in a space comic. -- Kyle in Titans. But if not in Titans, then in a space comic with Guy. -- Hal in an Earth-based comic. -- Let Geoff Johns figure out what to do with Baz and Cruz. Of course I never wanted Baz and Cruz in the same comic as Hal. But that was probably mandated from above. So if Hal's comic is set on Earth, then I called for everything they're doing, except with Baz and Cruz. Well lets just hope you're wrong Spy. That's the only thing that's been confirmed. And Guy and Kyle starring in a space comic is a very different animal from Hal, John, Guy and Kyle starring in a space comic. I hope they don't call the space comic The Green Lantern Corps. That name seems to connote a B title for some people, and they apparently refuse to buy it. Guy is the one character of the 4 real GLs that really works best being tied to another one of them in a buddy cop theme. He is the most colorful. That also makes it harder for him to exist on his own as a solo character, but I tend to forgive that because he works well with any combination of GL teamups. That Bleeding Cool article seems to suggest Morrison will be writing Hal in a new Green Lantern #1 in a new volume. They all but come out and say it. Officially over with #50. And the Venditti era as well. I'm curious to see how this pans out and if it's time for me to come back as a reader again. This is the cover of Green Lanterns #52. It REALLY looks like Hal is moving over into that comic. You've got to recognize how desperately DC wants Baz and Cruz to succeed. I'll make another prediction: If Jurgens writes a comic with Hal, Baz and Cruz in it, and Morrison writes a comic with Guy and Kyle in it, then Guy and Kyle's comic will sell better. Last edited by Trey Strain; 05-23-2018 at 08:12 PM. Of COURSE it would. Just from Morrison writing it ALONE will bring in readers that normally wouldn't read a GL title. That's not any kind of a bold prediction. The GLs title is already down to 24K currently 45 or so issues in. It would have a HUGE uphill battle to compete with ANY new GL #1 with Grant Morrison writing it. A new #1 with umpteen variant covers and Morrison's name will easily start out at 75k no matter which characters he uses. Here's something else. If Morrison were given a choice of writing one of those two comics, I bet he'd choose Guy and Kyle. He's known to think a lot of Kyle and not so much of Hal. BTW, I don't know how likely it is, but it's possible that John will remain in a comic with Guy and Kyle and will pull double duty in Justice League. Morrison is known to like John too. Anyway, we could see the three favorite Lanterns of Geoff Johns -- Hal, Baz and Cruz -- in one comic. I think we will.